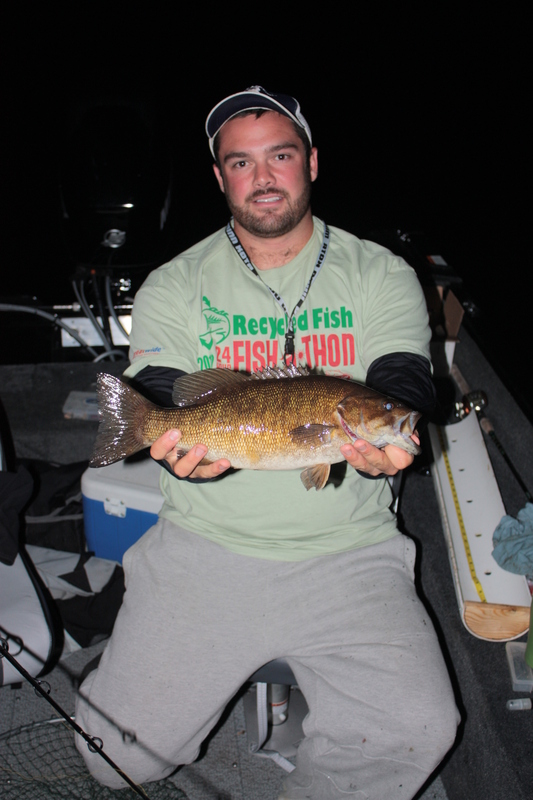 On Friday September 7th through the 8th we participated in the Recycled Fish 24 hour Fish-A-Thon. Dylan made the trip down to New Hampshire Friday morning to pick up his new boat and by early afternoon we were putting the final modifications on it to prepare it for the Fish-A-Thon. We hit the road around 5 pm so we would have time to make a few pit stops before launching the boat to make the 7pm start time. We spent the evening battling strong currents that are frequent on the Connecticut River. The rain we had gotten earlier in the week was still being released in batches from the dams upstream and the flows made fishing efficiently almost impossible. After the sun had set and the moon started to risem, we dropped the Hydro Glow Fish Light in the water to let it soak hoping it would draw in bait for the fish we were after. A while after the light was deployed, the first bite of the night came. 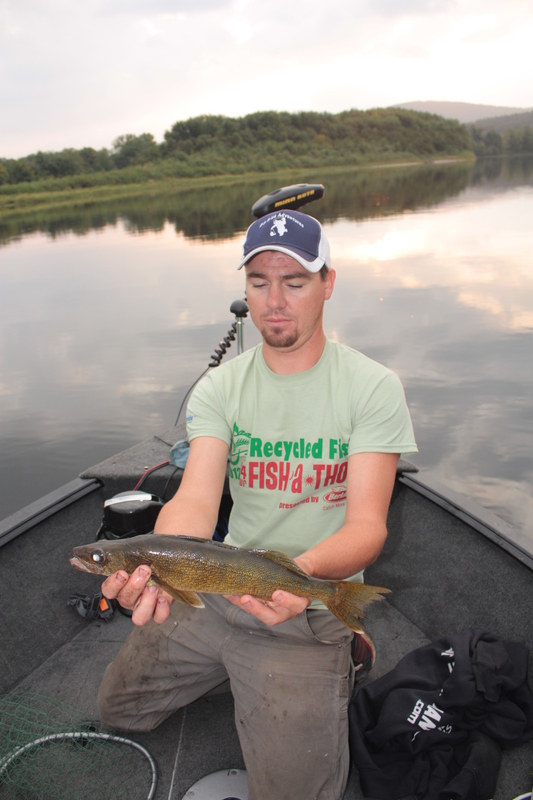 The first fish in the new boat was an 11″ bullhead. For the remainder of the evening the only action we had was several more bullhead and a mink that wanted to check out the inside of my new boat! As the morning started coming closer, we started trolling crankbaits over areas that frequently hold fish. We couldn’t do anything right. It seemed like the fish had just disappeared. They were no where to be found! As we continued our path towards our first destination for daylight, we found some fish that were holding on sandy shoals. As we ripped our crankbaits over them, the bass took the bait. We beat around the usual stomping grounds for a few hours after the sun came up picking a few walleye, rockbass, and perch. 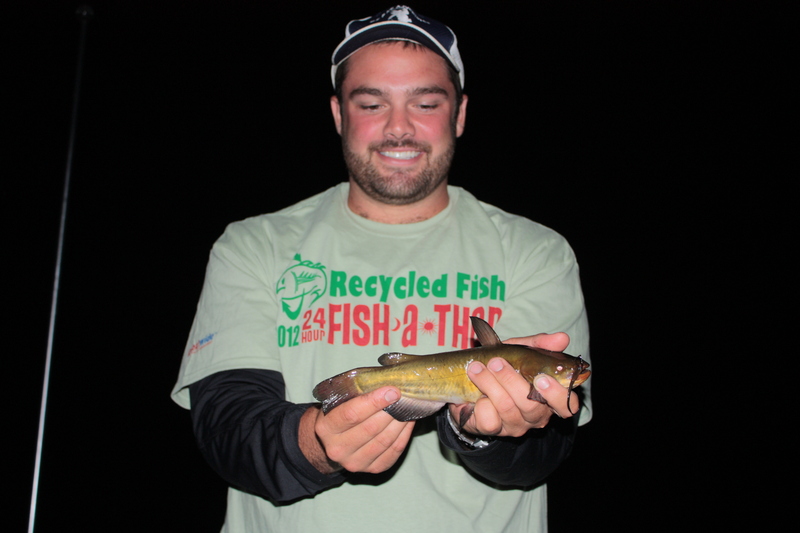 Overall, as far as the daytime fishing went, it wasn’t much better than the night. The fishing was so slow we contemplated moving the boat a short distance to jump a dam and search out some other fish that we have located previously. In the end, we decided to stay put and keep pounding the areas we had caught fish and to bottom bounce through some of the deeper holes that we had caught fish in recently. We made a move up river to search for new spots. 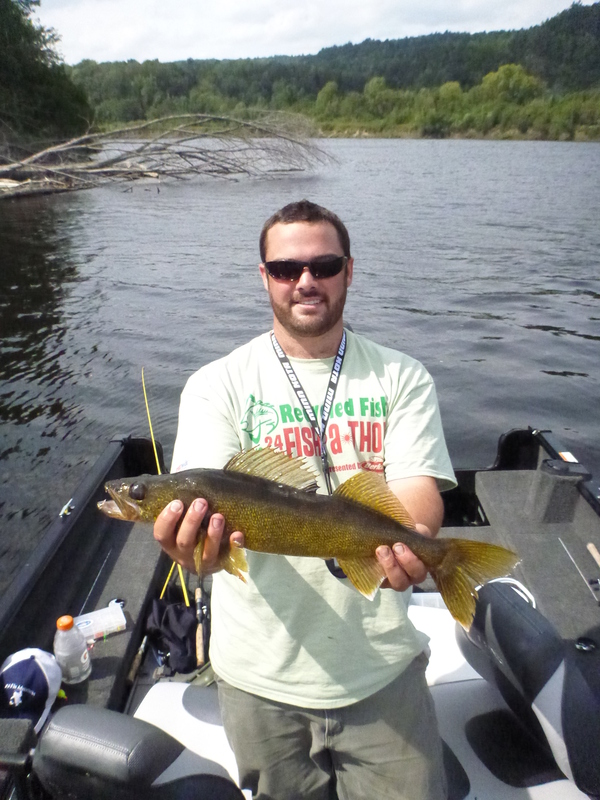 We found one where there was an abundance of fish but we kept losing them trying to get them up and out of the timber. After we realized we had hooked every fish that was willing to bite, we ran back to fish more structure as it seemed like the fish were turning on. We were rewarded with a few quality fish. We found that the best way to fish this day was to fish quick and move. After we would catch a few fish we would move on and then go back only a short time after. The majority of the fish would bite right off or not at all. We caught the majority of our fish on black and orange 1/4 ounce jig heads tipped with a whole crawler.